0920 Seymour IITM Wound Care Model is the most comprehensive & realistic model of its kind. 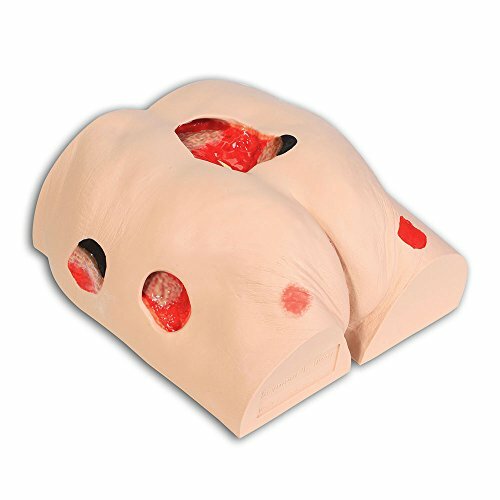 Molded from a 74-year-old patient, this model displays the following conditions: Stage 1, Stage 2, Stage 3 w/ undermining, tunneling, subcutaneous fat & slough, deep Stage 4 w/ exposed bone, undermining, tunneling, subcutaneous fat, eschar & slough. 0920 Seymour IITM Wound Care Model displays the following pressure injuries (per NPUAP 2016 - National Pressure Ulcer Advisory Panel): Stage 1, Stage 2, Stage 3 w/ undermining, tunneling, subcutaneous fat & slough, deep Stage 4 w/ exposed bone w/ osteomyelitis, undermining, tunneling, subcutaneous fat, eschar & slough. Also shown are a DTPI (Deep Tissue Pressure Injury), unstageable full eschar/slough wound, & a 5 1/2" dehisced wound. Great care has been taken to hand paint each wound just for the most life-like presentation. Wound assessment is critical to the operation of health agencies. Inaccurate wound assessment can misdirect the plan of care, affect reimbursement, cause inaccurate reporting of patient outcomes & the appearance of potential adverse events. This model is an effective tool for educating all healthcare professionals & patients in the identification & staging of wounds & their probable etiologies. Once the etiologies are understood, they can be discussed & treatment plans devised that will deliver optimized patient care. Seymour IITM is also an excellent visual aid for educating those who cannot read well, allowing them to see what can occur w/out proper care. Routine cleansing & dressing changes can be taught & practiced on all the wounds by healthcare providers, patients, families, & caregivers. Seymour IITM is made of a life-like material that permits the application & easy removal of dressings, w/out leaving an adhesive residue. The Stage 3 & Stage 4 are positioned so that a "bridging" dressing for use w/ a vacuum assisted closure & negative pressure wound therapy devices can be demonstrated & practiced. Students can learn to identify and stage and their probable etiologies. If you have any questions about this product by VATA, contact us by completing and submitting the form below. If you are looking for a specif part number, please include it with your message.